Biocell Collagen II with Hyaluronic Acid Type II collagen, which is mainly sourced from chickens and plentiful in chicken broth, is known for its jointsupporting properties. This type of collagen is a major part of our gut lining and helps it act as a barrier between the substances we consume and our bloodstream, which helps our digestive system run smoothly and also benefits our immune system. Biocell collagen provides nutrients for supporting collagen as well as tendon and connective tissue health. Supports skin and joint health, promotes joint comfort and stimulates cartilage producing cells. Collagen promotes healthy skin, moisture content and appearance. Type II collagen, which is mainly sourced from chickens and plentiful in chicken broth, is known for its skin and jointsupporting properties. This type of collagen is a major part of our gut lining and helps it act as a barrier between the substances we consume and our bloodstream, which helps our digestive system run smoothly and also benefits our immune system. It's also a major building block of cartilage, which is why it's so crucial for joint health. This high-quality Vitamin B-complex supplement provides a full range of B Vitamins for healthy nerves, skin, hair, muscle tone and more. 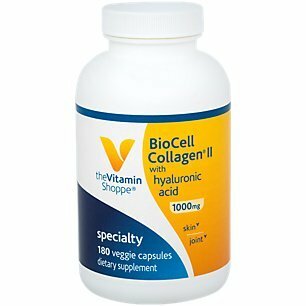 Biocell collagen provides nutrients for supporting collagen as well as tendon and connective tissue health. Supports skin and joint health, promotes joint comfort and stimulates cartilage producing cells. Collagen promotes healthy skin, moisture content and appearance. Type II collagen, which is mainly sourced from chickens and plentiful in chicken broth, is known for its skin and joint-supporting properties. This type of collagen is a major part of our gut lining and helps it act as a barrier between the substances we consume and our bloodstream, which helps our digestive system run smoothly and also benefits our immune system. Directions: As a dietary supplement, take two (2) veggie capsules two (2) times daily, preferably on an empty stomach. If you have any questions about this product by The Vitamin Shoppe, contact us by completing and submitting the form below. If you are looking for a specif part number, please include it with your message.